It’s was another exciting day for the children as we had two, one month old ducklings visit Mary’s Schoolhouse in Valencia, CA. It was another positive and fun learning experience for the children as they had the opportunity to interact with the ducklings and learn a little bit about how to care for them. I would like to extend our sincere thanks to my friend Krysti Ferguson for volunteering her time to bring the ducks to our home child care and share with the children. The ducklings visiting our preschool were one month old and it was surprising how large they were. The kids were especially curious about the size of their webbed feet. We don’t know what the scientific term is for a duck feet, but we know they are also called flippers. The ducks were friendly and didn’t seem the least bit phased by the children holding and playing with them. 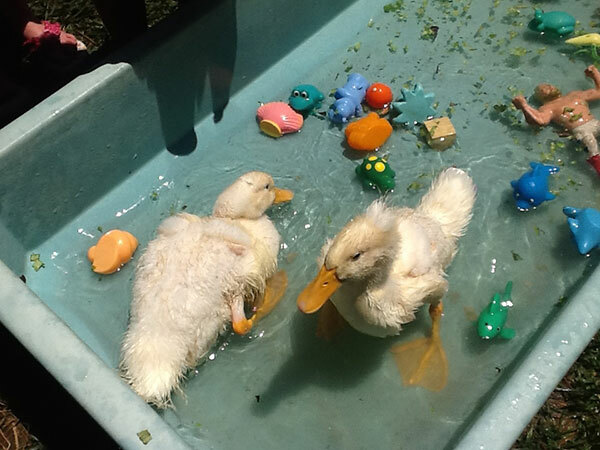 We filled our water table full so the ducks had somewhere to swim and they did not hesitate to jump right in. Another interesting fact about ducklings is, they reach adulthood in just 12 to 16 weeks, depending on the breed of duck. 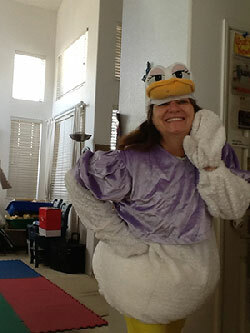 Do You Have a Home for Some Ducklings? We often celebrate special days at our preschool and the results can be outstanding. The children learn the subject matter faster and it really sticks with them as they continue to learn and grow. When our children move on the Kindergarten they are always fully prepared for the academic routine and have the social skills needed to continue their education in a public school environment. Thank you for visiting and we hope you enjoyed reading about our one month old ducklings visiting Mary’s Schoolhouse in the Valencia Northpark Community.